In 2009 Bitcoin burst onto the scene with the promise that cryptocurrencies would revolutionize the way that transactions were performed. No more would governments control the flow of money and tax would become a thing of the past. It would be up to everyman – aided by advanced algorithms to be the master (or mistress) of their destinies in a brave new world of digital currency. The question still remains in many people’s minds – is Bitcoin a legitimate investment, can it live up to the promise of its early days and become even more widely accepted as a payment method – or is it merely another in a long line of currency-focused scams. The extreme volatility of Bitcoin has also fueled fears that it would not be able to operate as a bona fide currency without the guiding hand of a central banking system to smooth out the rocky patches of extreme swings in value. What is the truth? As usual, it lies somewhere between the poles of Bitcoin being the broom that sweeps the current deck of fiat currencies clean – and the being simply a fad and one that is doomed to the dustbin of history. Pundits, such as financial consultants and stockbrokers who have for decades been at the forefront of tracking traditional currency performance are by no means upbeat about Bitcoin. They write buyers of the crypto currency off as incredibly naive and falling for the wiles of the modern day crypto snake oil salesmen and women. However, despite some enormous swings in value Bitcoin, much to the surprise of many of these pundits are still around – and that might be due to the influence of a diverse group of buyers, each of whom invests in the currency for very different reasons. First, there were the early adopters who could to a certain extent be termed the idealists. They wanted to buy into (literally) the idea of a digital currency that was untraceable, private and not subject to the scrutiny of third parties such as financial institutions. Bitcoin, thanks to its cryptographically secured (public) ledger seemed to tick all the boxes. According to its inventor, Satoshi Nakamoto, it would also have the advantage of eliminating charges on credit cards and reducing transaction fees. Then there were those who longed merely for less government interference in their day to day lives – including in their financial affairs – these have been called the ‘libertarians.’ Nakamoto was scathing when it came to the ability of central government’s ability to manipulate the money supply by just making more of it available. Bitcoin had a hard ceiling – there could only be so much of it around. If you are looking for ou en acheter, Bitcoin and crypto currencies are available from a lot of online exchanges! Then there were the young idealists. These were savvy youngsters who were caught up in the idea that technology could transform the world around us for the better. In their minds tech entrepreneurs were the leaders of a world in which inequality based on access by an elite to vast sums of money would become a relic of the past. Much to their surprise they quickly joined the elite after buying small amounts of Bitcoin and seeing the price skyrocket. Of course, two other groups have influenced the value of Bitcoin, traditional investors and those who want a hedge against market volatility that might affect the value of their portfolios. Whatever the future of Bitcoin it is apparent that the diverse nature of investors means that it is protected from extinction at least. Volatility in value, however, seems to be something that investors will have to live with. You have probably heard or used the cloud before. Its functions are not limited to storing photos and videos. It also allows you to run devices, watch movies and series anywhere, even with your mobile phone. The cloud: what is this technology used for? Maybe you don’t realize it, but when you watch videos on YouTube or when you post on Facebook, you use the cloud. Indeed, this technology provides software, services and storage space via the Internet. It is different from traditional hard drives, used in various devices such as computers or smartphones. For business use, many companies use the cloud to run their applications, run online services, and analyze or store their files. To do this, they use systems provided by third parties such as Google, Microsoft, Amazon. Users of this technology pay according to the storage volume and the power used. This system is very flexible and less expensive than traditional IT. Besides, if a company wants to keep all its data, it can choose a private cloud that will be specially designed for it. However, this system is a little expensive. Most companies need both public and private clouds. And many of them are picking from different cloud providers. This technique is beneficial because it avoids depending on a single cloud that is likely to be the victim of a cyber-criminal attack. It is necessary that the different clouds be compatible, which explains the buybacks of Open Source software (free and editable) allowing interactions. In a short time, the cloud has become a high-growth and profitable IT market. The U.S. Department of Defense has issued a call for tenders that could reach $10 billion. Specialists point out that we live in an era where the cloud will allow new technologies to emerge. According to Gartner, this sizeable public cloud market could grow to $340 billion by 2022, now knowing that it is at $287 billion worldwide. AWS (Amazon Web Services) is the market leader. Amazon took the lead by starting to provide public cloud about ten years ago. And now it dominates the market. Indeed, AWS is highly profitable, with a turnover of 6.7 billion. Google does not give exact figures, but its non-advertising revenues are $4.6 billion. 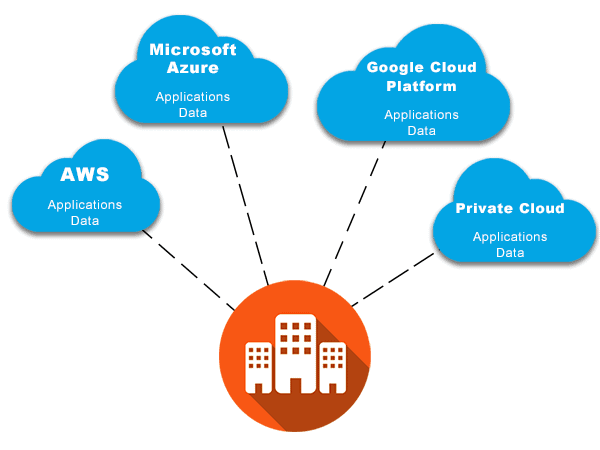 The cloud in 2019: multi-cloud, serverless and containers. Three technological trends already occupy people’s minds when it comes to deploying data in the cloud: multi-cloud, serverless and containers. If they continue to be used by businesses next year, their full integration may take time. What is less obvious is the speed at which companies will continue to adopt these technologies. Based on the “active data” of more than 1,600 customers using the Sumo Logic platform, one report points to three trends in the cloud. First, multi-cloud adoption and deployments doubled, with Amazon Web Services leading, but followed by Microsoft Azure and Google Cloud Platform. Second, the adoption of serverless architectures continues to grow: one in three companies uses AWS Lambda technologies. And three, one in three companies uses native orchestration solutions or managed by Kubernetes. Finally, 28% of companies use Docker containers in AWS. This data should not surprise you since the market explosion. But it is interesting to confirm that companies are rapidly migrating to the cloud. Societies are neglecting basic storage and IT infrastructure services for the services used by the most modern companies, for example, multi-cloud management, serverless computing, and containers. But what does this reveal about next year’s deployments? First, there are many costs associated with multi-cloud technologies, in addition to managing the additional complexity that will be required. However, enterprises will quickly take the lead, primarily through the use of advanced cloud and multi-cloud platforms. Second, the absence of servers will become systematic for the development of most future cloud services, including databases. Easier to use, it allows you to eliminate third parties from decisions to provide additional computing or scaling resources. Besides, these developments of cloud services with this technology will enable serverless subsystems to be improved and listened to more quickly. It puts additional pressure on traditional PaaS systems. As the container market grows, so does Kubernetes. It has become a standard for those who want to run container clusters, at any scale because the solution has become a heavyweight in the industry and so much. What is less obvious, however, is the speed at which companies will continue to adopt these technologies, which can be inconsistent. There is likely to be a slowdown in integrations shortly if the technologies and bandwidth needed for deployment are saturated. Nobody can precisely predict the future of the cloud technology. But with the competition and constant innovation, we can hope that it will be for the better. If you want to get WordPress hosting for your website, this article is here to help. You have to make sure you find an excellent hosting service for your website if you want your website to do well. Here is how to find a company that offers WordPress as one of their hosting options. You’re going to want to know whether you can use WordPress with a hosting service or not. It means you’re going to want to look on their website to see if they mention that they have the ability to host this kind of website. If you can’t find any information on their website about it, then you should contact them to ask if their hosting services include the ability to install and use WordPress. If the company doesn’t give you a definite answer, move on and work with a company that will tell you straight up whether they can host your site correctly or not. You’re going to want to find a host that is well reviewed before you work with them. There are many websites offering quality reviews out there such as les meilleures sociétés d’hébergement wordpress de 2018. You need to find out whether they are worth your time to work with or not. You need to find out what people have been saying in recent days regarding the work they have done with the hosting service. If the reviews you find show that the company does good work, then it’s clear that they are good to work with. However, if all you find are negative reviews, then you know not to waste your time with them. Figure out what you’re going to have to pay to host your website. You want to make sure that it’s not that expensive because there are plenty of great hosts that will host your website for a few dollars each month. Know that if you sign up for a hosting service for more than a few months at a time, you generally get a more significant discount. You may also be able to find coupon codes that you can use when getting a service’s assistance so look into that and see if you can save more money on the price of their hosting services. Many hosting companies will have WordPress built into the dashboard that you use to control what goes onto your website. You’re going to want to ask them whether you can install WordPress from the dashboard or if you have to do the work yourself. If you have to do it on your own, that’s okay because it’s not that difficult to do if you follow the instructions you can find online. Just search for WordPress installation guide, and you should be presented with results that show you what to do. WordPress hosting is now something you know a little more about. You want to find a place that is going to host your site for a reasonable price, and that has the features you need. There are plenty of great hosts out there so take your time and look for them. Google maps replace its planisphere with a terrestrial globe. Last week, Google updated the desktop version of its online mapping service by replacing the planisphere system with a globe. With all due respect to flat earth supporters, such as Kyrie Irving from the Boston Celtics, last weekend’s Google maps update gave a much more spherical shape to its virtual planet Earth by offering a world’s planisphere matching the famous Mercator’s projection. If this modification does not seem to bring any modification within the framework of the traditional use of Google Maps, it is by zooming out that the magic of the cartography service works by proposing not anymore a flat world map, but well a terrestrial globe in 3D. A desire to represent the earth more realistically. If Google chose to abandon the planisphere, it is because the giant of Mountain View wishes to propose a vision of the earth much more realistic than the planisphere of the world allows according to the Mercator projection. Imposed as the standard planisphere in the world thanks to the precision it could bring during sea voyages, Mercator’s projection has the main flaw of enormously distorting the areas that are furthest from the equator, by presenting Europe, for example, as more extensive on earth than South America, when in reality it is almost twice as large as Europe. To overcome this problem, Google has opted for a representation of the earth in the form of a globe, which provides a representation of the world much more realistic than a planisphere allows. However, the introduction of the globe is not the only novelty that the Mountain View giant has brought to its mapping service. By activating the satellite mode, it is now possible to travel in space. With this update, Google has doubled its efforts by giving its users the possibility to observe live which surface of the earth and planets are illuminated by the sun, the effects of lighting on the earth from space or the possibility to visit other planets or natural satellites. Browser: Chrome, Edge, Firefox… Is there a better browser? We often hear fans of a browser defend it, arguing that it is better than the competition, whether it be Chrome, Edge or Firefox. The question we are therefore entitled to ask ourselves is: which is the best web browser between these three alternatives? Chrome, Firefox or Edge? Like many, you used a web browser for a while before getting angry at it. Then you tried the competitors and finally choose another one. So finally, which is the best web browser to surf the web serenely and efficiently? What is the best web browser between Chrome, Firefox, and Edge? The easiest way to get a more or less precise idea is to submit them to a series of different benchmarks and rank them according to the results. What came out of these different benchmark tests? Note: it is essential to specify with which configuration this series of Benchmarks was carried out because apparently with another model the results could evolve in one direction or another… It is also important to specify which version of the browser was used in each case. The five benchmarks were run on an Intel Core-i5 laptop, supported by 256GB SSD and 8GB RAM, all under Windows 10 (64-bit). And you, which browser do you use every day and why? Last December, Magic Leap lifted the veil on his augmented reality glasses, which had been making a lot of headlines for several years without us knowing exactly whether it was another standard AR product or a technological revolution. After another few long months of silence, the Florida-based company, which managed to raise 2.2 billion dollars (2 billion euros) for this project, finally announced something concrete for the launch of its Magic Leap One glasses. This will be released this summer in the US. No precise date for the moment, but we do know that the product will be distributed exclusively by the AT&T operator with whom an agreement has just been sealed. As far as price is concerned, Magic Leap has not given up anything more than his initial indication that glasses should cost at least as much as a high-end smartphone. Based on the prices of an iPhone X or a Samsung Galaxy S9+, the Magic Leap One could be worth between 1,000 and 1,500 dollars, at least. In a long video presentation broadcast via the Twitch platform (which can be viewed on YouTube), developers in charge of the project delivered some technical elements on the hardware and software configuration of their AR glasses. We learn that it uses a SoC (system on a chip) Tegra X2 from NVidia that incorporates two 64-bit ARM processors. The operating system is a hybrid creation that includes 64-bit Linux as well as loans “to other systems” that are not mentioned. On the other hand, we still do not know what is the autonomy of Magic Leap One nor how it manages the execution of applications (locally or via Internet ?). What about the actual AR field of view ? The presentation was punctuated by extracts demonstrating how the helmet works. We discover a game featuring a golem that the user “installs” into the real setting with finger pinching gestures. Visual cues let you know where you can insert virtual objects. The character integrates into the environment in a credible way, sometimes on the ground, on a sofa or the work surface of a kitchen. Note that the headset not only detects hand movements, but also the user’s movements. When the golem throws a rock in its direction, it can avoid it by taking a side step or block it with its hand. It will be up to video game and application developers to make the most of these capabilities. The demonstration is quite convincing, but let us remember that it has been pre-recorded and that we do not know if it has been embellished or not. We remember that Magic Leap admitted having used special effects for some of his previous demonstrations. One of the remaining questions concerns the real field of vision provided by the Magic Leap One, which will necessarily be restricted to a frame. The same question had arisen with the demonstrations of HoloLens glasses from Microsoft which suggested a total immersion whereas the vision in real conditions was more limited. As for the Magic Leap One, we should know more about it and how it works as soon as it is on the market. The blockchain revolution : how does it work ? The blockchain is often associated with Bitcoin, the virtual currency created in 2008. It is a sort of decentralized account book controlled collectively, on the peer-to-peer principle, from a distributed database. It is the blockchain that ensures the security of transactions by sharing trust. A system reputed to be transparent and tamper-proof, the scope of which goes far beyond currency alone. What is the blockchain and why are we talking about a revolution about it ? Behind this system for securing Bitcoin transactions lies a concept that bases its reliability on transparency and mutual trust. Some think that the blockchain is led to play a central role in our existence by replacing trusted centralized third parties such as banks, notaries, insurance companies and more. The blockchain was born at the same time as the cryptographic currency called Bitcoin and appeared in 2008. Bitcoin is used to purchase goods and services ; it can also be exchanged for other currencies. Unlike traditional currencies, Bitcoin is not administered by a single banking authority, it operates in a decentralised fashion through a set of nodes. These form the network through which all transactions are made. A secure public register keeps the history of all these operations. It is considered forgery-proof since it is based on the principle of shared trust. Each transaction is encrypted and stored in a block, which may contain several separate transactions. A block contains a numerical marking from the previous block that attests to its validity. This marking operation is carried out by voluntary users, who are called “miners”. The latter make their time and the computing power of their machines available to administer the blockchain. The miners form the nodes, or rather the links of the blockchain. This operation called “mining” allows these people to be paid, in Bitcoin of course. The Bitcoin value is maintained by software that adapts the intensity of the calculations to the number of active miners. The more bitcoin miners there are, the more complex the calculations are and the safer the blockchain is. Furthermore, the transparency of the system and its decentralised architecture give it a potential for applications that go beyond the financial sphere. The blockchain being a register, it can be used to establish a traceability on all kinds of products and services. It can also be used to ensure the application of intelligent contracts, programs that automatically execute the terms of a contract. If you own a car made from 1996 going forward up until today, you might have noticed that the vehicle has some standardized computer systems. The computer systems are responsible for monitoring emissions and electrical sensors within your car as you drive. This has been a major innovation in the automobile industry over the last 2 decades! However, after recording the information, you will require an On-Board Diagnostics popularly known as OBD tool to retrieve it. OBD scanners can detect problems in your car before you even notice so they can be essential. In this article, we focus on how these OBD scanners work and how they are essential for your vehicle. If your car is not working correctly, usually there would be a dashboard warning or the Malfunction Indicator Light (MIL) will illuminate to indicate that something is not right. However, these signals only tell you that something is wrong but do not say what exactly is wrong with your car. That is where the OBD scanners come into use. By plugging the scanner into your car and reporting a code, the device will give you detailed information on what is wrong. Given that today’s cars are far more involved in both electrical and mechanical systems, it can be hard to detect a problem in your car without an OBD scanner. What are the different types of OBD Scanners? Two types of OBD scanners are available, the “code reader” and the “Scan tool” scanners. The code reader scanners can read and clear necessary codes in your car while the scan tool scanners can perform functions that are more advanced. It is advisable you have the scan tool OBD scanner because with it you can view both real-time and recorded data. What is more is that the advanced scanners can provide advanced troubleshooting information. Even though most people use ODB scanners to test for emissions, the devices have more uses that include measuring different aspects of your car’s performance. The ability of these devices’ ability to provide accurate information, however, depends on how well you use them. For instance, once you get a code, you must define it correctly. If not careful, you might mistake a P0303 code for a P0455 with the first code meaning that you have a misfiring cylinder while the second one means that you may not have screwed the gas cap correctly. Regardless of how you want to use your scanner, it is essential that you have one in your car. As aforementioned, the scanner can be very critical in testing your car’s performance and possible troubleshooting problems. Moreover, the scanners are very active and suitable bearing in mind that the cars manufactured in this era are far more complicated. For cars manufactured from the year 1996 going forward, they computerized systems that have made it possible for the use of OBD scanners. The scanners help to measure the car’s performance, troubleshoot problems and provide you with detailed results. However, you should be very careful while defining the codes while using the scanners or you will end up getting the wrong information. An OBD scanner is one that you should have in your car at all times because you can never tell when disaster will strike.